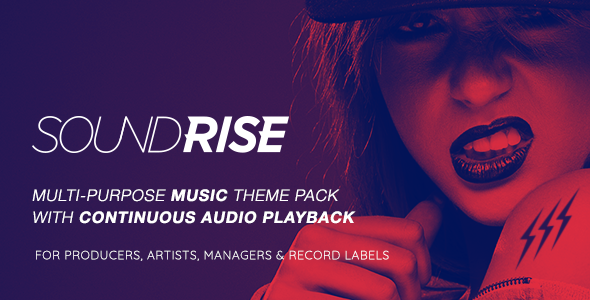 SoundRise is a theme dedicated to music label, producers and artist management company. With SoundRise, you will be able to create a stunning website for your music. It’s a perfect theme to promote electronic press kits, online merch stores and your beautiful music. - Fixed: 404 not found with past events. - Fixed: Issue with the auto-play player when using non-ajaxified theme. - Fixed: Language Switcher now fully working when switching to another page. - Fixed: When using a non-fixed menu, the color in the individual page settings wasn't working. * To update the plugin Soundrise-music, Visual Composer and Revolution Slider, go to WP-Admin > Plugins > Delete the plugin then go to Appearance > Install Plugins > and re-install the plugin. You won't loose anything. - Added: New demo: Indie. This demo showcase a beautiful one-pager with a video background hero ! - Added: Icons for store list in the album pages and tracklist. - Added: No-Ajax class if you don't want a menu to load via the ajax page loading. Instruction: Add the class 'no-ajax' to your menu item. - Fixed: Now the music won't stop if you come back to a page that has an auto-play audio player. - Fixed: Now the language switcher appears in the menu if you add the language switcher widget in the language widget area. - Fixed: Order of social icons to be the same on both desktop and mobile. - Added: Scroll anchors animation within the same page. ** To update the plugin Essential Grid, locate the file in /includes/plugins/essential-grid.zip and unzip to your computer. Then replace the file located in wp-content/plugins/essential-grid/ by the new ones. — To update the plugin, go to WP-Admin > Plugins > Delete the plugin then go to Appearance > Install Plugins > and re-install the plugin. You won’t loose anything. - Updated: Visual Composer to 5.2.1. To update the plugin, go to WP-Admin > Plugins > Delete the plugin then go to Appearance > Install Plugins > and re-install the plugin. You won’t loose anything. - Added: Artist names, album title and release date above the tracklist player. - Added: Better sidebars interpretation. Now you can set a universal sidebars for all your single posts instead of doing it one by one. - Added: Demo's content files to import along with Video tutorial on how to install a demo. - Fixed: Video Grid template now working. - Fixed: All artist names related to your playlist now shows up in your playlist single page. Before, only the first artist name was shown. - Updated: SoundRise Music to version 1.3.1. To update the plugin, go to WP-Admin > Plugins > Delete the plugin then go to Appearance > Install Plugins > and re-install the plugin. You won't loose anything. - Added: New SoundCloud, Spotify, MixCloud and ReverbNation Visual Composer Element ! Add your favorite third party player to any of your pages using this new widget ! - Added: Option if you don't want to have a logo on the header. - Fix: Removed hover fx on event list and playlist grid on mobile. - Added new push menu effect called "Overlay".